The energy is then stored in what is a called a Virtual Power Plant (VPP) which facilitates the control and monitoring of the assets. Before each day of trading starts, the system uses a mean of forecasting to predict approximately how much energy will be created in the day. It is cost effective for the peers involved as they become prosumers: they produce and consume the energy. There is also no middle man involved which leads to lower costs and higher flexibility on the products since there is no commission. Additionally, although there is a disintermediation, all the transactions and documentations are virtualised and stored automatically. The energy is tokenised and each block on the blockchain stores the contract between the producer and the buyer of the energy traded. This leads to all transactions being in the same formats and conforming to the same protocols. This means that in the long term, consumers might not need to rely on major energy providers as they did before. 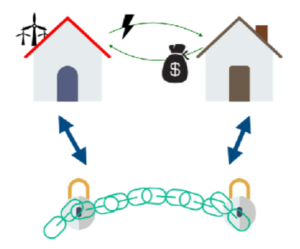 Additionally, the use of micro grids enhances the reliability of the services as it involves a local area – meaning that in the case of a storm where power supplies are cut between energy providers and consumers, they would still be able to rely on energy through the one produced by their neighbours. Let’s take a look at the figure below, on the one hand Sonia (house on the left) has wind turbines in her garden but produces too much energy each day that her household will not need, on the other hand Richard (house on the right) would like to find a cheaper and more green way of powering his home. Sonia will then transfer the extra energy to Richard (for a fee) and the transaction will securely be stored in the blockchain. In short, green energy prevails and there is no wastage. Using the blockchain technology, Sonia and Richard will not need to use any third party because they will both trust and agree the rules of the system. This means that the transaction will be stored in the blockchain once it has been accepted by both parties. The transaction would potentially only need to store the names of the buyer and seller, the amount of energy necessary and the amount paid for it. Because the transaction is stored in the blockchain, there is no need to worry about others tempering with the data.